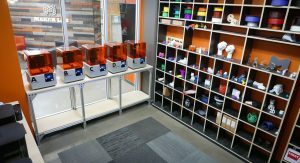 The Maker Lab built a brand new 3D printing suite over the holidays, thanks to an anonymous year-end donation The five new FormLabs resin printers and finishing stations will increase 3D printing capacity and quality for ACU students, faculty and staff. The Form 2 printers deliver high-resolution prints, using a laser to cure solid isotropic parts from a liquid photopolymer resin. These printers will make it much easier for ACU students, faculty and staff to explore the world of 3D modeling and 3D printing through Form Lab’s one-click printing workflow; automatically orienting, supporting, and laying out 3D models. ACU students, faculty and staff who are interested in learning how to use the new Form Labs printers, or learn how to start designing and modeling 3D parts, can make an appointment with a Maker on Duty or simply come in and explore first hand what all the excitement is about.